Smoking is prohibited in all the public areas of the hotel and in “non-smoking” bedrooms (art. 51 legge n. 3 del 16/01/03 e del DCPM 23/12/03). As per hotel policy, our luxury suites can accommodate a maximum of 3 persons. Service of alcoholic beverages, in all bars open to the public, will finish at 2.00 am. (Legge n. 160 del 02/10/07). Passport or other official form of photographic id is needed in order to use the hotel’s internet services / telephone booths (Decreto legge 155/05). The use of cooking appliances, open flames and irons is strictly prohibited. Electronic safes are available in every guest room and suite. Interviews and photo shoots are permitted, but only with prior consent from the hotel office of Public Relations. 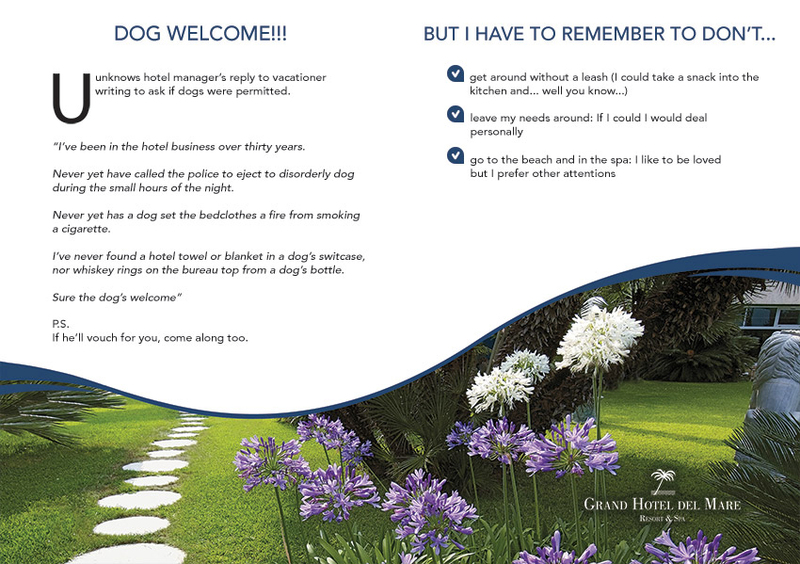 For lost and found enquiries, please contact Guest Services (+39 0184262201). The entire hotel site is protected with an Intrusion Alarm System, monitored around-the-clock by the hotel Security team. An in-house fire, evacuation and first aid brigade is on duty around-the-clock and acts immediately in case of emergency. Access to guest room floors is only permitted after registration at reception. Children under 18 must be accompanied by a parent. When a minor is travelling with other adults, written authorisation from their parent, accompanied by a photocopy of their passport, must be given to reception at the time of check-in. The hotel management reserves the right to close any part of the facility for essential maintenance without prior notice and without entitlement to compensation. The hotel is not responsible for any physical harm incurred whilst using Spa and fitness facilities, also arising from prior disorders or illness. Access to the Grand Spa del Mare is limited to persons over 16 years of age. No dogs or other animals are permitted in the Grand Spa del mare or in pool areas. It is compulsory to wear pool slippers or shoe-covers, and bathrobes in the halls and bar area. Swimming in outdoor pools is only permitted during opening hours under supervision by pool attendants.